This Mother’s Day give your mom the gift of flowers and honor her with Teleflora Handmade Flower Bouquets that are beautiful and radiant just like her! Some of the bouquets you will find are Sparkle and Shine Bouquet this is chic and modern just like mom! 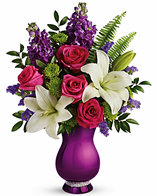 With gorgeous pink roses, white lilacs and lavender sinuata statice, sword fern and huckleberry make it look oh so lovely in this unique vase that has a metallic purple glaze with a band of sparkling rhinestone at its base. 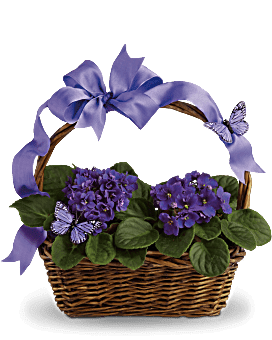 Violets and Butterflies on the wings of love, send your best wishes with a living gift basket of eye-catching African violets. Two of the most popular houseplants are presented in a natural handled basket that’s decorated with two playful butterflies it wired satin ribbon. 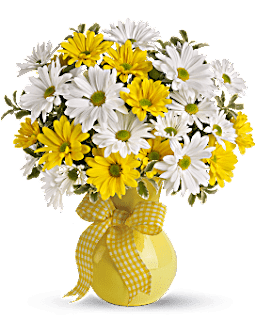 Upsy Daisy, you can surprise someone you love this Mother’s Day with an array of amazing daisies in a charming yellow vase that’s bright as the sunshine. We’ll be singing your praise for days to come. Dancing Violets Bouquet will make mom’s heart dance, adorned with a modern motif of pressed violets, this gorgeous glass cube is a marvelous Mother’s Day surprise with purple carnations, lavender daisy spray chrysanthemums, and white daisy spray chrysanthemums are arranged in bupleurum by role eucalyptus and leather leaf fern. I got the Dancing Violets Bouquet which is just beautiful and I like all the purple as purple symbolizes wealth, royalty, and status according to historical context but I just think purple is a beautiful color and I know my mom will too. This bouquet arrived promptly and it’s just stunning from Warren’s Florist which is local to me. According to the National Retail Federation (NRF), “flowers remain among the top gifts for Mother’s Day; with more than 66.5 percent of consumers planning to buy flowers for mom.” And since flowers are one of the most popular gifts for mom this holiday. Super 4 : Welcome to Enchanted Island!